The author writes as King Neb, describing his latest dream in the first person. 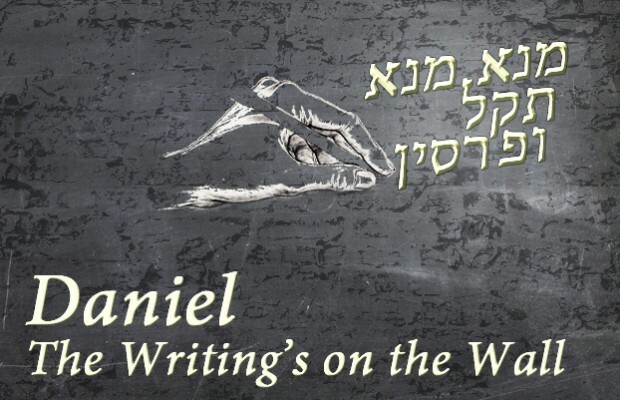 It’s a humdinger, and Daniel interprets it as a morality tale, intended to teach the king that heaven is the true ruler (v 26). In v 28 the dream comes true! And lo and behold! He learns his lesson, and began to worship Yahweh, and they all live happily …. Well, till the next chapter, anyway. Anyway, ‘King’ Belshazzar hosts a great feast, and he brings out the fancy dishes – the ones looted from Solomon’s temple. 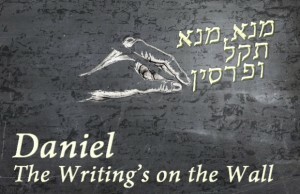 Yahweh’s pissed, and Belshazzar sees the writing on the wall – literally (v 5). But what does it mean? Time to call Super-Dan, who can always be counted on to decipher anything, no matter how obscure. 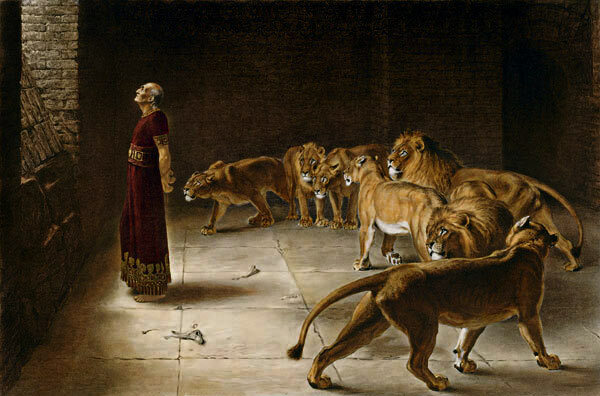 Predictably, Daniel tells the king that it’s all his fault because he has not humbled himself to Yahweh, and so his days are numbered, he is inadequate, and his kingdom will be divided among others. And that very night, Belshazzar dies (how? did god kill him? doesn’t say), and Daniel is rewarded and lives happily… for a while. 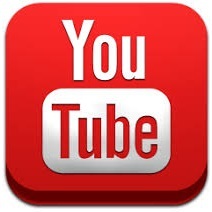 The old Moody Bible Institute videos offer up highly biased, sanitized versions of these well-known stories. Non-Christians are described as ‘pagan’, ‘cruel and selfish’, ‘vain’. Also, in this video, the ending is entirely fabricated – the bible doesn’t say what or who killed Belshazzar, so where did Moody get all this stuff about the ‘great enemy army of Cyrus’? In this episode, Daniel has attained a high-ranking position in Darius’ government, and his underlings scheme against him. Of course, Daniel is so pure and perfect that they can’t get any dirt on him, so they have to concoct a way to find fault. They persuade Darius to sign a law forbidding people to pray to anyone other than the king; it’s no surprise what happens next. 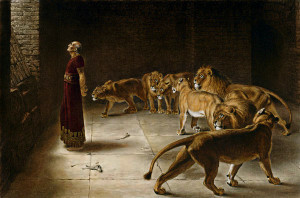 When Darius finds out that Daniel has been caught by the new law, he feels remorse, but follows through on it anyway, and tosses Dan to the lions. A stone is placed in front of the entrance to seal it – but when the king goes to check the next morning, Daniel is alive and well (remind you of another bible story?). The king turns on the men who maliciously entrapped Daniel, and throws them – and their families (WTF?) – to the lions, where of course, they become mincemeat in short order. Darius praises Yahweh and they all live happily ever after….